When: April 7-8, 2017 at 7:30, House opens at 7:15, There will be one fifteen-minute intermission. Erring Star Theatre Company embarks on its first production for a developmental staging of Emily Atkinson’s Act of Contrition, supported in part by a grant from the Northampton Arts Council, a local agency which is supported by the Massachusetts Cultural Council, a state agency. It is 1593, and Kit Marlowe--playmaker, poet, spy--is dead. So what is he doing in what looks like Will Shakespeare's bedroom? This is a story about love, about grief, about repentance; about what it means to sell your soul before you know it's real; about memory, creation, poetry and forgiveness in the midst of a world dictated by fear, lies, and harsh politics. Combining sharp wit and an ironic sensibility with an evocative portrait of loss and desire, Atkinson’s production, as much a love story as a spy story, enthralls the audience in the vivid, dangerous world of Elizabethan England, in all its violence and brutal glory. Emily Atkinson will receive her MFA in Playwriting from Smith College in May. Act of Contrition recently had a reading through the Smith College New Playreading Series, as did her plays Fruit in Winter, an earlier draft of which was shortlisted for the Brink! Development Series at Renaissance Theatre, and An Exorcism at Cambridge. Her short play Dominance Hierarchies of the Great Apes, which had its first reading at a Smith College MFA Showcase she produced, received a concert reading at the Region 1 Kennedy Center American College Theatre Festival in February. Her directing debut was as co-director with Kathryn Blakeslee on a production of Doctor Faustus at Smith College in 2013. She received her BA in English and Anthropology from Smith College and her MPhil in Biological Anthropology from Corpus Christi College, Cambridge. Midnight, late spring, 1593. Kit Marlowe is dead and on a mission. Will Shakespeare is drunk and grieving. Kit wants—needs—to tell Will one last story, of spies and betrayal, doubt and faith, love and fear. 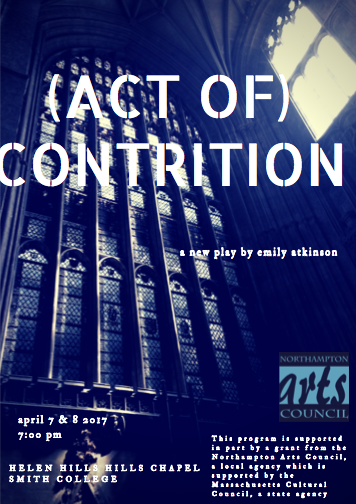 Act of Contrition is an ironic tragedy about two brilliant young men caught up in forces beyond their control, whose only refuge is their unequaled imagination. This play may not be appropriate for those younger than 17. There will be an optional post-show talkback with the playwright and cast after the Saturday performance.